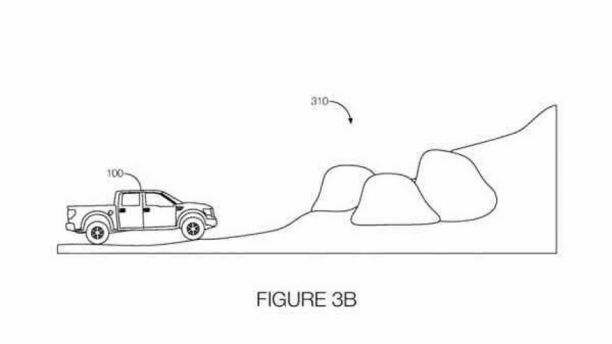 Ford has received a patent for autonomous off-road technology which combines input from various sensors. These sensors closely monitor a vehicle’s surroundings as well as topographical map data in order to determine the chances of it rolling over or losing traction while covering difficult terrain. In the event that the technology determines there is any room for danger, it will then notify the passengers in the vehicle that they need to get out of the vehicle. The vehicle would then try negotiating the terrain on its won while the human beings remain safe by traversing the area on foot. A remote control override is available to ensure that ultimately, the humans remain in control. Ford visualizes that the feature will be integrated with computer-controlled springs, shocks and roll-bars so that adjustments can be made to the ride by changing the ride height of the vehicle and stiffness of the suspension, depending on whether the vehicle is in fully or semi-autonomous mode and the number of passengers in the vehicle. The application for the patent stated that the technology could be modified for use in a wide range of vehicles, from pickups to cars and even bigger vehicles like vans. Ford has not revealed specific plans to use the technology, but it is planning on having an autonomous model run as part of a taxi service by 2012.